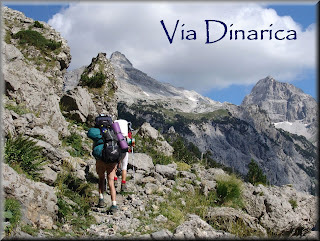 The idea of attempting the Via Dinarica orginated from Googling to this page on Summit Post after ruling out a continuation of the Via Alpina across Austria, having already hiked about 1000km of the French and Swiss Alpine sections on previous trips in 2012 and 2014. The other point of interest was that it was exactly 30 years since I'd last travelled through this part of the world when I'd solo Inter-Railed from Vienna to Athens through a fairly intimidating Yugoslavia back in 1985. I liked the idea that the route was billed as "a virtual project of a long-distance trail". This sounded suitably vague and challenging, and possibly a bit of an adventure - and hopefully nothing like hiking in Western Europe. 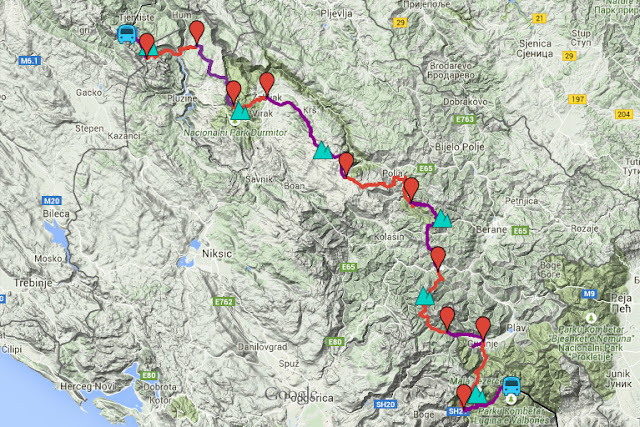 I clearly didn't have time to complete the entire route from Slovenia through Croatia to Bosnia, Montenegro and Albania in 2 weeks, so decided on starting halfway at Sarajevo. My original plan of hiking directly from Sarajevo was ruled out after discussions with Samer Hajric at Green Visions Trekking Company. Samer was super-helpful with bouncing around ideas, and for establishing an idea of what to expect with the "Accursed" Prokletije Mountains in northern Albania. Given the serious ongoing landmine situation in Bosnia, I was advised not to start from Sarajevo, but instead to jump on a bus to Sutjeska National Park near the border with Montenegro. So, after much planning and tweaking, my route ended up being more or less Stages 77 to 108, as advertised on Summit Post. The hike was 330km in 11 days from Sutjeska National Park in Bosnia & Herzegovina across Montenegro to Valbona in northern Albania, and took in several significant summits including Maglic 2386m (highest point in Bosnia), Bobotov Kuk 2523m (highest mountain entirely within Montenegro), Crna Glava 2139m, Kom Kucki 2487m and Maja Jerzerces 2694m (highest point in the Albanian Alps). Day 1 actually started the evening before on 18th June with an Easyjet flight from Glasgow to London Stansted, followed by an overnight flight to Istanbul with Pegasus Airlines, and an early morning flight to Sarajevo, arriving around 10:30am. Samer Hajric from Green Visions met me off the flight and treated me to a cappuccino and a quick discussion of plans before dropping me at Istočno Sarajevo bus station to catch the so-called Balkans Express for a 2-hour minibus ride to Tjentište / Sutjeska National Park. I managed to explain to the bus driver that I wanted to jump out at a bend in the road called Suha which would give me access to a track to Trnovačko Lake and Maglić (highest peak in Bosnia). Once the bus pulled away, I was struck by the silence and the sense of being alone in a wild mountain landscape. 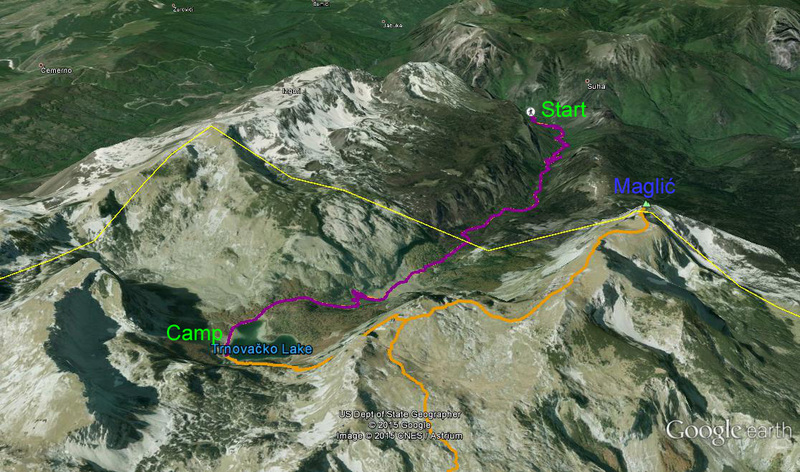 The hike up to Trnovačko Lake was straightforward enough, and I pitched my tent around the far side of the lake just before the trail started climbing into the forest for Maglić. That would wait until tomorrow. The good weather broke in the night for thunder & lightning, and torrential rain, so I awoke the next morning to low cloud and damp dismal conditions, which set the tone for the next couple of days.